The Brightwaters forum on Saturday saw volleys between the candidates for New York's 2nd Congressional District. 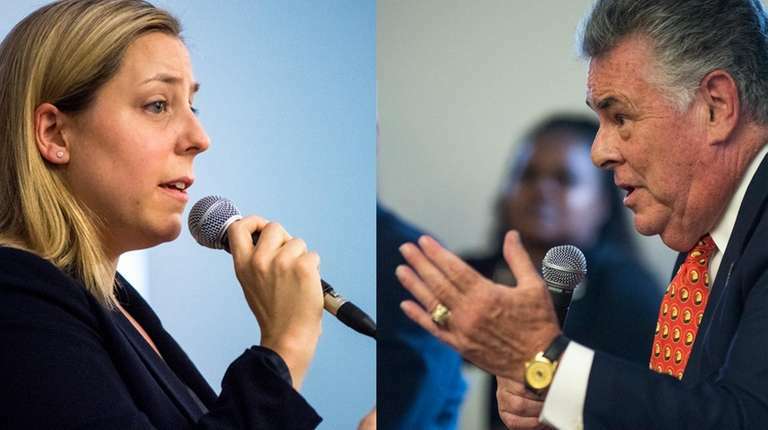 Tensions on the national and local stage boiled over Saturday at a Brightwaters town hall as Republican Rep. Peter King defended his record against Democrat Liuba Grechen Shirley, a progressive activist trying to deny King a 14th term. A moderator at the forum, sponsored by the Islip Town branch of the NAACP, urged candidates to treat the event as a “job interview” and avoid “cheap shots” and attacks. The event drew about 200 people to the Bay Shore-Brightwaters Public Library. The two still managed to spar on a range of issues in their first matchup before the Nov. 6 election to represent New York’s 2nd Congressional District, which spans from eastern Nassau County to central and western Suffolk County, including Fire Island communities. King, 74, of Seaford, highlighted his bipartisan record and role as a powerful advocate for New York’s interests in Congress. He mentioned the praise of Democrats over the years, from Sen. Chuck Schumer and Gov. Andrew M. Cuomo in New York to House Minority Leader Nancy Pelosi in California. King also defended his record on border security and support for law enforcement officers and gun control measures. Referring to the MS-13 gang, he described some Long Island communities as "killing fields," the same phrase that President Donald Trump used during his visit last year to Brentwood. The two battled over last year’s Republican tax bill that limited the state and local property tax deduction to $10,000. King said that “New York is a minority in Washington” and the legislation could have been worse. “Mr. King was not able to protect us,” Grechen Shirley countered. King attacked Democratic lawmakers and candidates who called for abolishing U.S. Immigration and Customs Enforcement. “When we have people out there, because somebody wins a primary in the Bronx, and she says abolish ICE, the people just follow like lemmings along, I will not do that,” he said, referencing Democrat Alexandria Ocasio-Cortez, a progressive who defeated Queens Rep. Joseph Crowley in a June primary. Early in the forum, moderator William Moss, president of the NAACP's Islip branch, threatened to call out candidates directly for attacking an opponent.